Bush: Economy Sound Despite "Storm Clouds"
"But the underpinning is good," Mr. Bush told business and community leaders at a gathering of Rotary Club members. Mr. Bush tried to position himself as an advocate for working families by taking aim at his favorite target: the Democratic Congress. "The most negative thing Congress can do in the face of economic uncertainty is to raise taxes on the American people," Mr. Bush said. During the appearance, Mr. Bush also confirmed the government will again use military air lanes for some commercial flights over Christmas. The Transportation Department is expected to formally announce a repeat of the strategy that was used over Thanksgiving, reports CBS News White House correspondent Peter Maer. The Transportation and Defense departments are working on a final plan for the days and times when some East Coast air space, normally reserved for the military, will be cleared for commercial flights. Officials say an estimated 100 commercial flights used the military space during the busiest times in late November. That is a small fraction of the total number of flights in the air but the administration contends the strategy helped ease congestion. Meanwhile, the audience of roughly 80 people listened to Mr. Bush with respectful silence. Yet a line that normally gets him applause - "I'll veto any tax increase" - drew no reaction at all. Mr. Bush chose to highlight positive economic news, such as job growth. "People are working; productivity is high," Mr. Bush said. He acknowledged the nation's major economic woes - mainly the housing and credit crunch - in the context of explaining what his administration is doing to help. 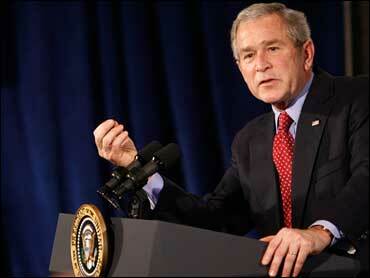 "We can mitigate some of the issues," Mr. Bush said. "I just want to let you know we've got a strategy. And Congress can help," the president said, citing a list of bills he's proposed to lawmakers. Mr. Bush spoke at the Yak-A-Doo's restaurant inside a Holiday Inn. The White House wanted to keep the flavor of the local Rotary meeting, so there was no banner or backdrop. Mr. Bush was not even introduced; he just showed up, drawing a round of applause. The Christmas music being piped was not cut off until someone pointed that out. After months of bickering with Congress, Mr. Bush pronounced himself pleased with the shape of spending levels that Congress is expected to approve this week. He said any measure must include money for troops in Iraq and Afghanistan. "We're making some pretty good progress toward coming up with a fiscally sound budget," Mr. Bush said. He said that the next couple of days "will be interesting to watch."